•	Students shall attend the school only in the prescribed uniform on all days. •	The students have to be in proper and neat uniform throughout the day. 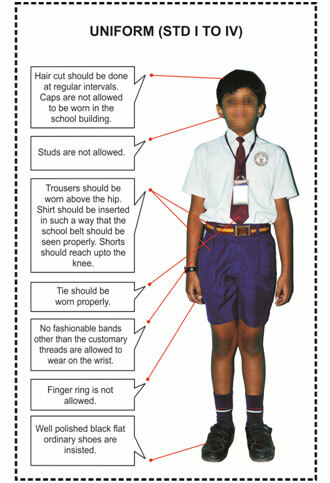 Students without wearing the uniform are not allowed in the classrooms or on the school premises on regular working days, except on their birthdays. •	Finger nails should be clipped regularly & long hair should be neatly banded. •	Sandals instead of shoes may be worn only on rainy days. •	Wearing jewels and other accessories is not allowed and management will not be responsible for the loss of any. •	LKG-Regular uniform and white uniform will be provided from the school on the basis of measurement taken. •	UKG-Regular Uniform and White uniform will be provided from the school as needed. Regular Uniform : White Shirt and navy blue shorts should be stitched by parents. White uniform T-Shirt and house dress will be provided from the school as needed. 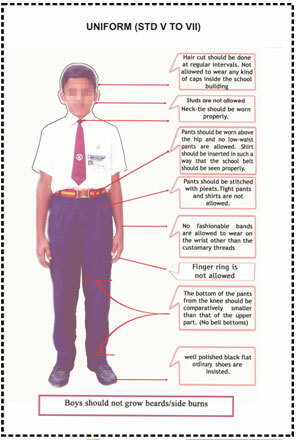 Regular Uniform : White Shirt and navy blue pinafore should be stitched by parents. Regular Uniform : White Shirt and navy blue pants should be stitched by parents. Regular Uniform : White Shirt and navy blue skirt and navy blue coat should be stitched by parents. •	It is mandatory for all students to wear their school ID Card while in the school campus. •	It is compulsory that all students come to school only in the stipulated school uniform even on days of special functions and rehearsals, unless specified otherwise. •	On rainy days the students may use only black Sandak Sandals. 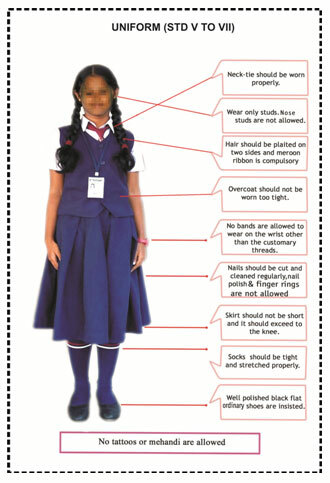 •	The uniform skirt or pinafore should be of knee length. •	Low waist pants are not permitted in campus. •	The shirt is to be tucked in properly. 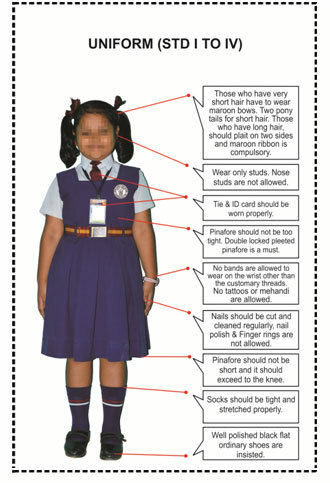 •	Girls must wear slips or tights as applicable to their uniform. •	Shoes must be clean and neatly polished. •	Personal hygiene is to be maintained. •	No jewellery is permitted except small ear studs for girls. •	If a student makes any alteration in the pattern or the stitching of the uniforms as is prescribed by the school, disciplinary action maybe initiated by the authorities, after making a record of a warning in the Student’s Academic Planner.